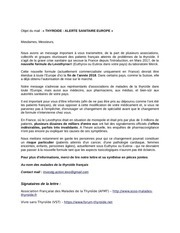 Ce document au format PDF 1.5 a été généré par Microsoft® PowerPoint® 2016 / 3-Heights(TM) PDF Merge Split API 4.9.17.0 (http://www.pdf-tools.com), et a été envoyé sur fichier-pdf.fr le 19/04/2018 à 09:43, depuis l'adresse IP 86.223.x.x. La présente page de téléchargement du fichier a été vue 122 fois. 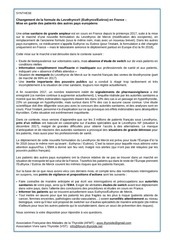 Taille du document: 1.3 Mo (15 pages). this new formulation throughout Europe by the end of 2018.
crisis which is still unresolved. distress for patients, and also for health professionals. a green light, despite our warnings which have not been relayed by the French Government. any patient at all, for the sake of risk prevention). We are at your disposal to answer any of your questions. new formula is planned to be marketed throughout Europe by the end of 2018.
civil claims have also been filed for lack of information. hypothyroidism or having undergone thyroidectomy. formula in the long term, on real patients. levothyroxine-based drugs, as these drugs have a narrow therapeutic margin. information was provided, and it was incomplete and inaccurate. “no change is expected for patients&quot;. train its medical representatives to inform doctors about its new products. analysis of the new formula. with this treatment for many years, sometimes decades, an option. months, which is the shelf life of the new formula. Europe and where Merck has just built a gigantic plant? the end of 2018, while permanently excluding a return to the old one. the old formula or switch to another brand? the European Commission to inform them of your opposition to such a change. you may, like us, become victims. and social networks&quot; (and which also relativizes, even invalidates, the hypothesis of a nocebo effect). hypo and hyperthyroidism with normal or disturbed blood test values. insurance data (SNIIRAM data base). 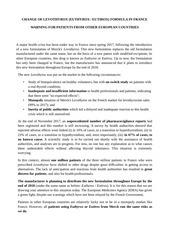 of formula (a report only available in a summarized format, which preoccupies the patient associations). national pharmacovigilance survey by the ANSM. article (in French) on VIDAL.fr). declarations submitted between 15 September and 30 November 2017 (the &quot;second survey&quot;). result of rumors, media coverage of such symptoms, or simply by reading the package insert). knowing that this drug is also used mainly by women), the average age was 55 years (+ 13 years). The number of pediatric cases was 17. General symptoms: fatigue (9.4% of all reports), asthenia (3%). Gastrointestinal disorders: nausea (2.4%), diarrhea (1.6%). Alteration of clinical or biological measures: weight gain (3%), increased TSH (1.7%). Ear ailments: dizziness (5.5%), tinnitus (0.2%). Cardiac disorders: palpitations (1.8%), tachycardia (0.9%), arrhythmia (0.2%). order, with a predominance of general, neuro-psychiatric and musculoskeletal symptoms. 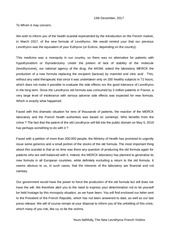 to formally exclude a link with the taking of the new LEVOTHYROX formula&quot;. 1,745 reports of adverse reactions included sufficiently documented biological analysis. 67% (1,172 declarations) were associated with normal TSH (euthyroidism). 23% (394 declarations) were associated with high TSH (hypothyroidism). 10% (179 cases) were associated with low TSH (hyperthyroidism). under levothyroxine with normal TSH (Mc Millan et al. 2016). hyperthyroidism in patients whose TSH varied, following a change in formula (89%) or not (11%). but with results that are difficult to interpret – different populations, ages, numbers, etc. month after the transition to the new LEVOTHYROX formula. with the same alternative, due to supply difficulties. adverse reactions, with or without TSH disturbance, evoking signs of hypo or hyperthyroidism. 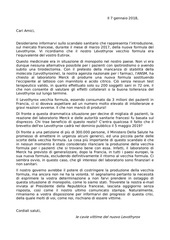 composition of this new LEVOTHYROX formula. (SNIIRAM), including a study of use and a study of risk. patients. So we have to go further to explain this phenomenon. hyperthyroidism, whereas they mostly occur at normal TSH. of associations, media crisis, petitions and court proceedings, etc.). of 2002 and the Touraine Law of 2016 have yet reaffirmed the important place of patients. nocebo effect, a simplistic solution&quot;. association of clinical endocrinologists, and the endocrine society. Endocr Pract. Ce fichier a été mis en ligne par un utilisateur du site. Identifiant unique du document: 00586899.